BBC 4K iPlayer: What's next for 4K content from the BBC? | What Hi-Fi? BBC 4K iPlayer: What's next for 4K content from the BBC? The BBC talks 4K plans, from TV compatibility to streaming developments and future content trials. 4K TVs may have been around as long as internet memes, but a live 4K broadcast is still comparatively novel. While UK pay-TV providers – Sky, BT and Eurosport – have been in the game for a few years, broadcasting the likes of Premier League matches, MotoGP, Formula 1, Aviva Premiership rugby and tennis between them via satellite, this year marks the first time the BBC has offered live free-to-air content in 4K and HLG HDR. Following its iPlayer-hosted Planet Earth II and Blue Planet II on-demand trials in 2016 and 2017, the BBC has live streamed the FA Cup Final, a rugby fixture, 2018 Wimbledon tennis championships and the FIFA 2018 World Cup on its internet iPlayer platform. It also worked with Sky in the broadcasting of the 2018 Royal Wedding in 4K. These have all been trials. And as Phil Layton (head of broadcast and connected systems in BBC’s R&D) is keen to reiterate, this has been – and still is – a learning process. “This is a full end-to-end trial. We’re still learning about UHD production and how you make good HDR pictures. Each UHD HDR event has different workflows,” he said. So how successful have they been? What have they learnt so far? And what stumbling blocks need to be overcome to secure the BBC’s live 4K future? In the lead up to the World Cup, the BBC promised ‘tens of thousands’ of viewers would be able to access each UHD stream on a first-come, first-served basis - and it delivered. According to the BBC’s hot-off-the-press stats (which you can see in more detail here) the peak audience was 60,300 on 7th July, for the Sweden vs England quarter-final and day six of Wimbledon combined. One of those was around delays and buffering - and it’s something the BBC was not only well aware of, but was making on-the-go fixes. “The biggest change we made was in the delay. Latency comes from the streaming side - it’s in the stream technologies that we use [on iPlayer]. You have four-second [content] segments travelling around the networks and they buffer in various places and processes,” Phil explains. “We made some small changes in the second week of the World Cup and took 20 seconds out of the chain, so we got down to about 45 seconds at one point. As we’d not done this before on this scale, we started off conservatively when we set our chain up to make sure it was securely delivering the segments in a specific time. As we did some optimisations, we realised we could take some delay out. “The internet behaves differently the bigger the audiences, so the problems you don’t see in early stages only appear in bigger events. And it’s often hard to trace down where they’re coming from. We want to learn from that and help manufacturers understand how their algorithms work better for dealing with it. The BBC was running an adaptive bitrate streaming system, which meant a full-fat 3840 resolution was available to those with internet speeds of at least 36-40Mbps, with 2560, 1080 or 720 resolutions also available for those with slower speeds. But, sadly, encoding for live 4K broadcast content isn’t the same as encoding on-demand video. “People say ‘I can watch Netflix on-demand, but I can't watch BBC live’ - but it’s comparing chalk and cheese,” says Layton. “HEVC encoding [the BBC’s encoding tool]… is the only game in town at the moment, but it takes a lot of computational power. It isn’t a mature technology for live encoding. There are newer encoding tools that will offer low bitrates, but they come with higher compression times. Advanced compression appears to be an important development, then. But, as stated in a recent blog, the BBC is hopeful ‘higher compression efficiency can be achieved and will likely be available as part of a future video-coding standard in the longer term’. Another trending topic has been hardware support for UHD streams - and, notably, the lack of it on Samsung's 2016 4K HLG-compatible TVs. While the BBC couldn’t comment specifically on the Samsung situation, Layton did say this: “iPlayer needed very little modification to do UHD. All iPlayer does is play back the video object it’s given to play. The television is responsible for the decoding, for receiving the segments, and for picking the right ones according to the bitrate for the network. In terms of televisions, we don’t have anything specific in iPlayer, it simply relies on HbbTV and DVB underlying standards… those standards include DVB-DASH, it’s nothing BBC-specific. “If a TV supports those, it works. There aren’t specific changes for UHD playback in iPlayer. Because it’s HLG and backwards-compatible, our criteria was: if a TV accepts a BT.2020 signal and plays it back without interruption without buffering, we’d enable that device. What we don’t want is HLG on a 709 display because we don’t want it to look wrong. As well as coding improvements, the BBC also wants to see the workflow advance in other areas. 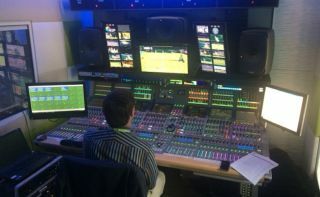 For Wimbledon, the 4K signal was sent up to the BT room, encoded in HEVC and then sent back over the BT network to the BBC’s New Brodcasting House in central London, where it was picked up onto its matrix and fed into the encoders it’s using for iPlayer. But before all that, there are processes to prepare the 4K signal. The camera feeds (from more than six 4K cameras on Centre Court) come into the UHD truck, where they’re checked and manually enhanced on a shot-by-shot basis using a MSU (Master Set Up Unit). The unit can make adjustments – effectively ‘offsets’ – to the HDR image, in terms of exposure, contrast, colour and so on. A person is needed to apply those changes to maximize the picture. If you only have a given offset for gain or blacks, it’s only applying an average to an average scene - without considering, for example, zoom lenses and variable light. But at the moment, that’s all happening for both the SDR HD and HDR UHD signals in two workflows. “People are racking [i.e. shading] the cameras in SDR, then they’re being converted into HDR. We’d like it to be the other way round,” says Simon Thompson (project R&D engineer). “In the long term, we want to go to a full HDR workflow [where you can grab the BT.2020 colour space and the dynamic range] and just take a down conversion off the HDR rather than working in dual mode in the truck - but that’s not possible for the moment,” Thompson continues. That method was practiced in Sky’s Royal Wedding production - 1.6 billion people watched the world feed (in SDR, BT.709), which was automatically down-converted from the HDR production. The other question is: will the BBC keep its live 4K ambitions strictly within iPlayer? The BBC making its live broadcast available on Sky Q, via the red button, led some (including us) to wonder whether ‘red button’ broadcast distribution is an end goal. But it appears not. “The streaming approach is what we’re working on. Sky Q doesn’t support iPlayer – that’s not their method – so if we want to do a trial with them, that’s how we have to do it,” explains Layton. And of course, the natural progression from a trial is, if successful, often a service. "The big events will drive this. The workflows and technology - these things only get worked out on big events. You have to do it for real. We’ve been lucky this year, we’ve taken big steps forward in workflows. We have to keep doing it,” says Layton. Naturally the BBC didn’t want to lift the lid on future trial plans, but we can be confident a ‘big event’ in the near future will feed the next trial. So, bets in - will it be Glastonbury next year? Or the 2019 Women’s World Cup? The 2020 Summer Olympics and/or Euro 2020, perhaps? The BBC also revealed it will run some High Frame Rate trials, at 120 frames per second (Wimbledon streams were 50fps). “We have to look at sound. We ran out of time here. Most of the issues we found were not at our end, they were with the receivers. We didn’t have time to work through with receiver manufacturers. We’d like to be offering 5.1, we’d like to be thinking about next-gen audio. Using some complex functionality in people’s televisions, which is part of delivering the service,” says Layton.